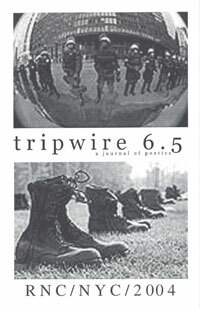 Visit the Tripwire website for updated ordering information and free PDFs for all back issues through 2015. Special RNC protest pamphlet, with work by Anselm Berrigan, Jules Boykoff, Taylor Brady, David Buuck, Jeff Conant, Laura Elrick, Carl Mirakove, Yedda Morrison, Rod Smith, Rodrigo Toscano. Download the PDF.